I’m collecting sunsets. Not literally of course. I’m just searching for good places to see the sunset because for me that is a way that I know God loves me. He shows me his love when he paints the sky with colors. Let me list a few of my favorite sunsets. 1. The evening I was all alone for the weekend. I was lonely and lacking confidence and feeling very inadequate. God showed me how much he loves me and that he was there at that moment by giving me a gorgeous sunset. I started in one place and had to walk to another in order to see it well. 2. With friends on the hill behind the library. We didn’t talk. We just enjoyed it in our own separate ways. 3. From the top of a hill/mini-mountain where I go to school. After climbing up the hill, I enjoyed the sunset on top of a rock. It was far from any cars and roads so there was only the sounds of wind and birds. 4. From a rooftop in Dublin. It wasn’t ideal because everyone else was drinking (I was having an orange and passionfruit soda because I don’t drink) but for a few moments I tuned them out and enjoyed the colors over the city. 5. 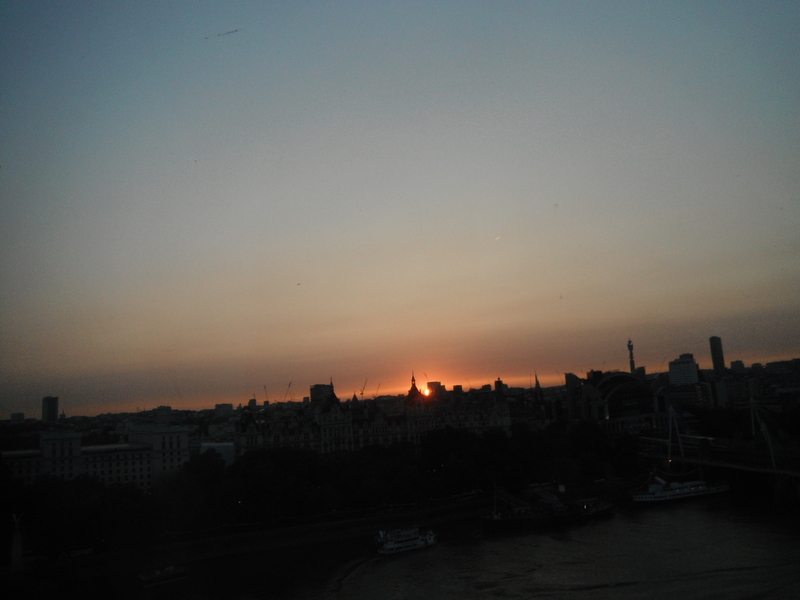 From the London Eye. I have wanted to go up in the Eye for a long time and to combine it with a sunset was ideal. I love London and heights and the colors made it more beautiful. There are more sunsets in my past but these are the five that come immediately to mind. I go searching for sunset watching spots. I actually have one in mind for this week. It’s dark now and sunrises are not as spectacular to me so it’s off to sleep for this girl. Cheers!